Swimming with the dolphins not exciting enough for you? Then you might want to take a trip to the Polar Bear Habitat in the Canadian town of Cochrane. 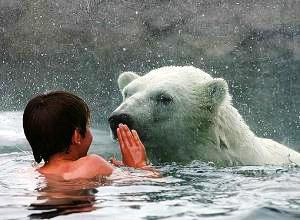 It's the only place on earth where you can (safely) share the water with a (potentially) man-eating polar bear! AH!!! I so want to do that!!!!!!! This is kind of unrelated, but did you guys know that the Toledo Zoo sometime last year had the only twin polar bears in the WORLD? And I live here! I haven't sen them in a while... I should go to the zoo! I, personally, will stick with dolphins. I would so love to do that. Wow! it sounds like so much fun to see a polar bear up close and i've never wanted to go swimming with dolphins! Polar bears are so cuddly looking. AHHHHHHHHH! RUN FOR YOUR LIFE!pOLAR BEARS! being in that library, Ananka! *sniff* I live in Germany. I have not been on for quite a long while and i missed many posts. 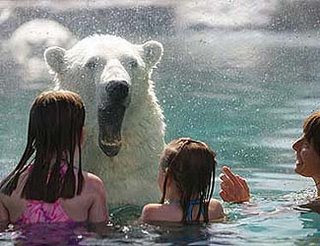 I think that is cool yet Polar Bears have always had somthing scary about them to me. Kad: yes, we missed you! Where have you been? Anywhere exciting? Spring: happy birthday!!! I didn't post your email, cause I don't want just anyone to see it! Go on the freaks blog and post it there and one of the members will add you! Hey, Ananka??? you know a few days ago you did a post on the disecting(i dont know if i spelt it right)on human bodies?? Well a friend just told me that a museum in St Petersburg(about half an hour away from where i live)is doing an exhibition on the disection of human bodies and they even have real there, sliced in half by...uh, lasers, i think. I cant wait to go and check it out!! ananka:can kiristen miller go to maryland on a saterday cuz i have to go to school can she?!??!?? I have comment moderation, so no one will see it, and I will add you! God that's cute. Jeez, I'd kill to do that kinda thing. i LOVE polar bears! Excuse my sister. ROFL JK!! That would be interesting. As long as the bears don't maim me, I'd definitely do it! i don't want to... but it's spring's birthday!!!!!!! and she got squirrel and another shirt. and she loves them!!!!! sadly untamed polar bears would eat me....right? It would be so cool Jin Ai if ther was a black shirt with the Irregular logo in gold on it. Check this out. Weird, huh? And could you come to D.C. in August or later? I have relatives in that area who'd let me stay with them. Well i would love to say i was off in France exploring the catacombs but actually i was just busy with homework and going on another fave site of mine alot and playing my Nancy Drew Computer games which are real fun. Haha. If you don't feel like telling, what city do you live in? I LOVE Rick Riordan's "Percy Jackson and the Olympians" series. You're so lucky to have him go to your school! Lara: That's amazing! I would love to see that! Elizabeth: Thanks again! If you want to be a reporter, you can send a note to kikistrike@gmail. In Hae: Welcome to the blog! Jin Ai: Excellent idea about the t-shirts! I'll look into it! Hazel: Let me see what I can do . . .
And when she saw what she had done, she gave her father forty-one." yes, and in a couple weeks some idiot will start messing with those poor vicious bears and will die or get injured badly and it will be all over the news and everyone will wonder why they got hurt when it is really the person who started this 'swimming with polar bears' fault. Hazel: I would love to have a room like that. I would probably eat it up. Aaah, the things I'd do for chocolate.